The 30 Series is a premium line of boutique, ALL SOLID tenor ukuleles approached from a classical or Spanish guitar building perspective. Most notably, Cordoba is using an integrated neck joint or “Spanish Heel” instead of a traditional dovetail joint to join the body and neck of the ukulele. This method of construction offers a lighter weight and more stable heel joint that increases resonance and is less prone to movement as the ukulele ages. Cordoba collaborated with renowned luthier Pepe Romero Jr. on the 30 series, adopting Romero’s vision of building ukuleles as if they are small guitars using traditional Spanish building methods. 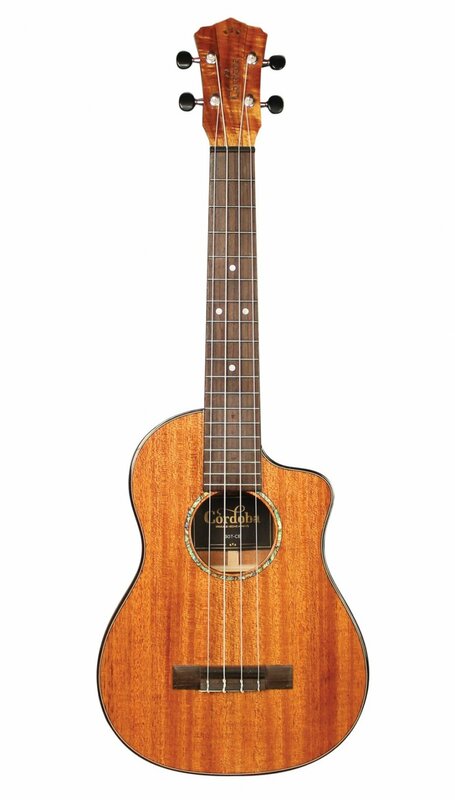 The result is an incredibly lightweight tenor ukulele with a deeper and wider body, featuring a Spanish heel neck joint, fan bracing, and a wider fingerboard for easy playability.All 30 Series feature a gloss finish , black TUSQ nut & saddle , chrome Grover tuning machines & Cordoba polyfoam case .